Every year since 2009, special trains have operated on the first two weekends of December in northern New Jersey and southern New York to collect donated toys for the U.S. Marine Corps Reserve Toys for Tots Foundation. Toys for Tots collects toys during October, November, and December each year and distributes them as holiday gifts to underprivileged children in the communities where the campaign is conducted. Our train benefits the Toys for Tots efforts at Picatinny Arsenal in Dover, NJ and Stewart Air National Guard Base in Newburgh, NY. 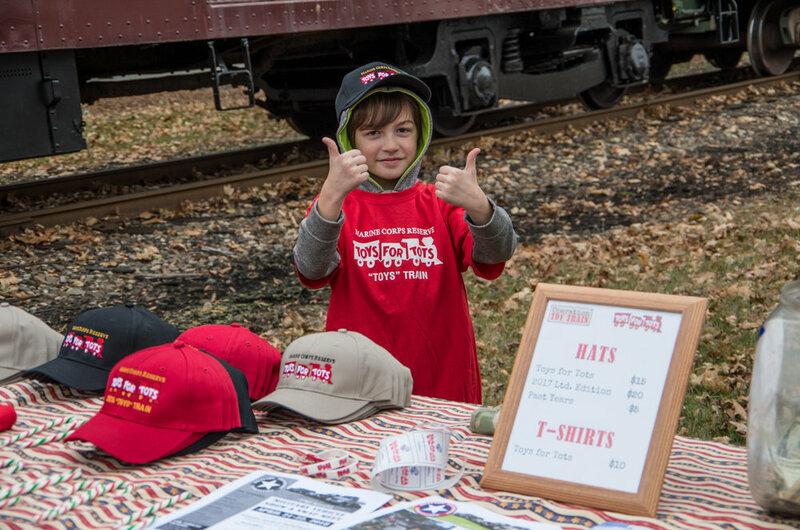 The train stops at 18 locations, where members of the public can drop off toys, board the train's caboose to see Santa Claus, view a variety of working railroad equipment, and meet members of the Marine Corps and the Operation Toy Train program. Bring your camera, Santa loves to take pictures with his friends! View our train schedule to see where our train will be stopping near you. Members of the public are encouraged to drop off new toys in their original packaging (no gift wrapping, please!) at local collection points in October, November, and the first week of December. Near each stop, our local business and organizational partners have large Toys for Tots collection boxes. If your business or organization is interested in becoming a collection site, visit our get involved page for more information. Five railroads (and their personnel) donate their time, equipment, and the use of their tracks to Operation Toy Train each year. Additional railroad equipment, funds, and volunteer staff come from a number of additional nonprofit and for-profit organizations. See what organizations are already on board at our sponsors page.